This is the moment to deepen, or commit to, your regular creativity practice. Regularity — a daily practice, if at all possible — is one of the best ways to stay in touch with how you make meaning. 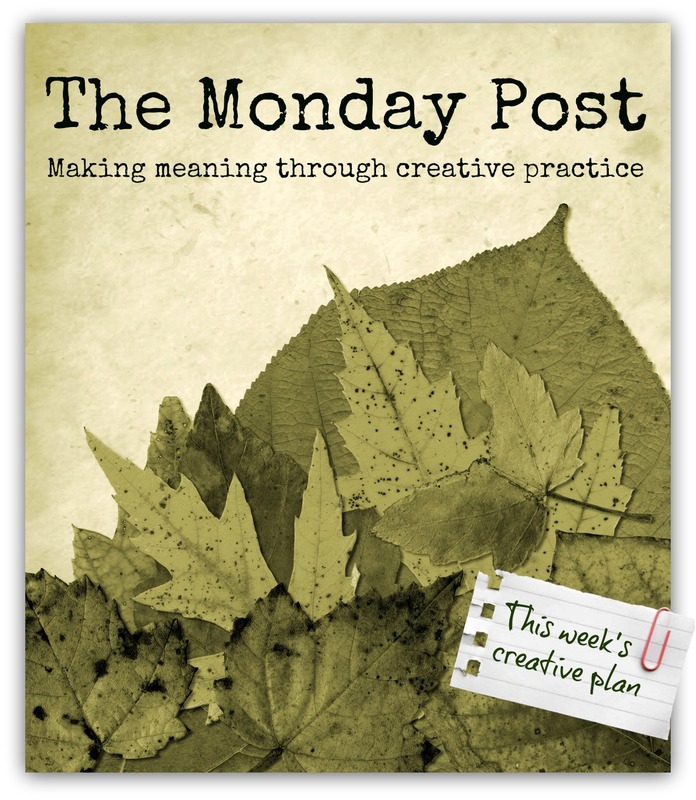 What are your plans for creative practice this week? Given the specifics of your schedule, decide on a realistic intention or practice plan — and ink that time in your calendar. The scheduling part is important, because as you know, if you try to “fit it in” around the edges, it generally won’t happen. An intention as simple as “I will write for 20 minutes every morning after breakfast” or “I will sketch a new still life on Wednesday evening” is what it’s all about. Share your intentions or goals as a comment to this post, and let us know how things went with your creative plans for last week, if you posted to last week’s Monday Post. We use a broad brush in defining creativity, so don’t be shy. We also often include well-being practices that support creativity, such as exercise and journaling. Putting your intentions on “paper” helps you get clear on what you want to do — and sharing those intentions with this community is a great way to leverage the motivation of an accountability group. Join us! If you’re an artist or writer with little ones, The Creative Mother’s Guide: Six Creative Practices for the Early Years is the essential survival guide written just for you. Concrete strategies for becoming more creative without adding stress and guilt. Filled with the wisdom of 13 insightful creative mothers; written by a certified creativity coach and mother of five. “Highly recommended.” ~Eric Maisel. 35 pages/$11.98. Available for download here. My plans for creative practice are to grout the mosaic I made over the weekend and to complete a slideshow about bread crumbs that I am making for a creativity course that I’m taking at Stanford. Between the devastation of Hurricane/Superstorm Sandy and the last-minute election frenzy, it’s been difficult to focus on creative work. I did have an excellent session last Thursday with my writers’ group — if you aren’t part of a regular creative meeting of the minds, in whatever your medium, I highly recommend finding/forming one ASAP. This week I’m easing back on my expectations, as I’ll be up late tomorrow night watching the election returns, and have a late night out on Friday as well. This will be an easy-does-it plan. Okay, okay, I miss checking in too! I’ve been uber productive with herbal creativity thanks to the December 1st deadline of the Open Studio pop-up shop. Between that and trying to maintain 2 trail runs and 2 yoga sessions a week, I’m using up all of my “free” time. My me time. After Hurricane Sandy disruptions and a 4-day visit from my folks, I am determined to get back into my healthy exercise/eating routine this week. Ironically these new practices need constant nurturing and don’t always hold up to the stress of non-routine events. Not to mention halloween candy. Begin again, begin again…. Last week I printed. I swear I made stencils and set-up the jello and printed away and then my 9 year daughter came home and in a very short time used my stencils and inks and made quite good prints on her own. Perhaps I’m overthinking things. work on a mask for a cool masquerade party friday! I’ve lost the thread of daily drawing again, get back to that! Hello. I just found this blog and I love the energy. I am an artist and mother of a two year old. I am trying to make of my art so I can stay home with my daughter. In August I challenged myself to paint every day. I got accepted into my first craft show last week, so I have a month to get ready. -Post on my blog three times. -Order paper supplies for show.